I attended the AP webinar a few weeks ago and I learned something new! It was all about taxes. Now, I have been very interested in taxes lately, what with the new tax schedules for this year and the upcoming changes, so my ears perked up! As with so many features in Escape Online, taxes are set up using cascading logic. The default tax rates are defined in the Finance-Setup-General-Fiscal activity. This sets the rates for the organization. The tax rates defined in the Fiscal record are the default. These fields are summed. In other words, the tax rate is the sum of the state sales tax rate, the county tax rate and the local tax rate. For example, the State of California has a tax rate of 7.5%, so you would enter 7.5 in the State Tax Rate field. But, if your county has a tax rate of 9.25%, you would enter 1.75 in the County Tax Rate field, giving you a sum of 9.25 (7.5 + 1.75). This rate would be used for all payments. 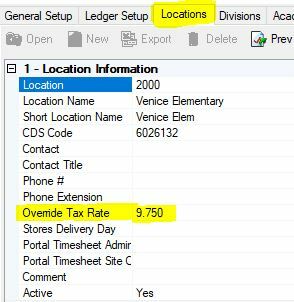 But, if you have a location that has a different tax rate, you can set that in the Location tab of the System-Setup-Organization activity. 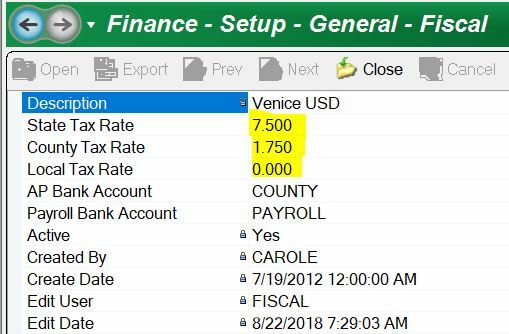 The tax rate in the Location tab of the Organization record sets the tax rate for requisitions and payments for that site (based on delivery). The Override Tax Rate literally overrides all of the fields entered in the Fiscal activity for the location. Specifically, Escape Online defaults the fiscal tax rate for every payment UNLESS the payment has a site delivery that matches a location where an override has been specified. In that case, it defaults the location tax rate. Check it out. Of course, as with most cascading logic, you can change the rate at the source, in the payment, using the Tax Rate Owed, Tax Rate Collected, Unpaid Tax Amount fields and Unpaid Tax Calculated Override. Now, that's some interesting information about taxes!